Other hotels include America's Best Value Inn, Crown Plaza Palo Alto, Mountain View Inn, and The Hotel Aria. There is ample FREE parking in the shopping center. 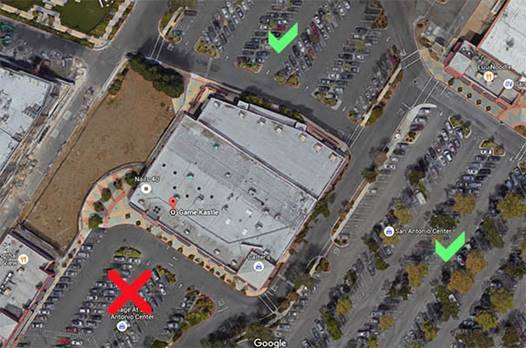 We are asking all attendees of Protospiel San Jose to park behind Game Kastle or off to the right side (green checks in photo below). Please DO NOT park in front of the store (red x below). Leave that parking for the people who need access to Trader Joes. If you park in back, there is a sidewalk that takes you right up to the Game Kastle entrance. Thank you! Uber and Lyft are widely available in this area for transportation.